clay and limestone: Bottoms Up! But, let's make a toast to the bees that visit and pollinate our flowers. They work hard~from sunrise to sunset. No vacations. No time off. Take these ginormous, pesty Carpenter Bees~ They are busy, busy, busy pollinating garden crops and garden plants while feeding and carrying for their young. They pollinate eggplant tomato, cucurbits, cassias, Carolina Jessamine, bee balm, aromatic sumac and wild lupine. I had to use this one again~It's a favorite photo! All the pollinators that visit or live in our gardens need a variety of nectar and pollen producing plants from early spring to late into the fall. Here at Clay and Limestone we celebrate all pollinators and welcome them with as many plants as I can cram squeeze into the garden. I don't mind that Evening Primrose could be called a thug. It's such a cheerful late spring flower, smells lovely and rips out easily. Look at how nicely it weaves among the perennials in the Sunny Susans Bed. Or, that Ox-Eye Daisy is a naturalized non-native. It grows well here and always attracts an interesting assortment of pollinators! because pollinators love bright colors. I do, too. Aren't I lucky that so many of my favorite natives are brilliantly colored. You can't beat the brilliant pink and lilacs hues of Phlox pilosa. Practically Perfect Pink Phlox is a favorite of many small butterflies, bees and gardeners all over the country. Let it seed about your garden to create lovely drifts of fragrant flowers in April and May. Just as the Phlox pilosa is beginning to fade, the humming bird and bees favorite, Penstemon X begins to bloom. P calycosus is a Central Basin Native that I can't say enough good things about! Not only does it tolerate wet feet, shade, dry soil and sun; it reseeds delightfully, creating drifts that make it easy for pollinators to visit. ~and speaking of drifts. Western Daisy is drifting about the garden. In the last month, small gnats, little bees, Hover Flies and a strange little pollen eating beetle (adult carpet beetle) have been seen on the flowers. PS ~ You know what's coming next! 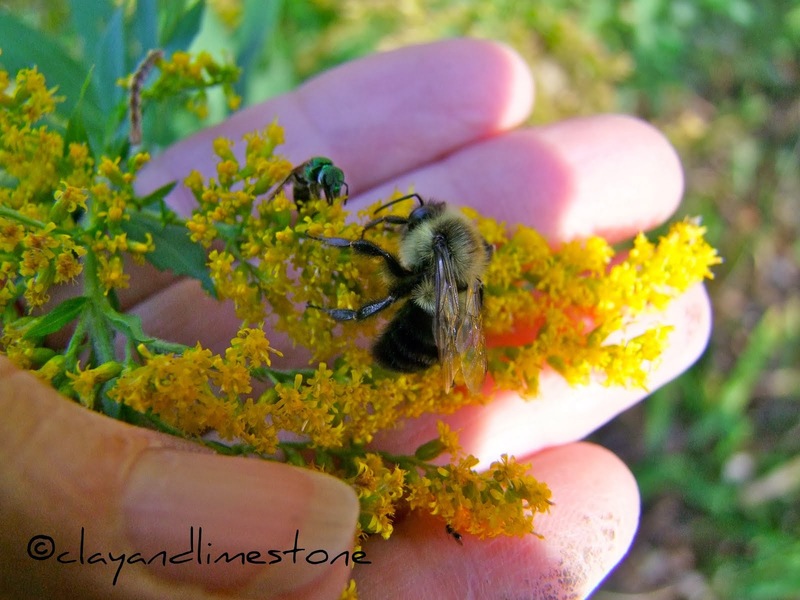 If you want pollinators~Big ones, small ones, odd ones, beautiful ones! Never, ever, ever, ever use pesticides in your garden. Your garden is a pollinator's delight! They may work all day with no time off, but at least it is a beautiful garden like yours. Oh, if I were a bee I would head straight for that garden on the hillside with so much to offer. Wait, I am not a bee and still want to head straight for that garden on the hillside. Someday. Yes, we must toast the busy bees! Your gardens are just beautiful Gail. I am amazed at the little 'hairs' on the bloom of the Penstomen. What great flowers. Thought of you yesterday, there was some little pollinator flying around and I didn't know what it was. Looked like a mini clear wing. Of course he was moving too fast to get a good picture, but I will keep trying. Beautiful photos of your lovely garden Gail. Your primrose and penstemon shots are fabulous. It is so great to see the bees feasting so freely. The colors and light are pure magic! Heres to gardens like yours and marvelous pollinators everywhere. Lovely shots! i love primrose, it's so delicate. Raising coffee cup to all pollinators except for the carpenter bee. They are destroying my wood shed hole by hole and tunnel by tunnel in the rafters of the roof. Yikes! Beautiful pictures. Bees are always so busy that is I see one sitting doing nothing I wonder if it is ill. Of course it is probably resting - not something you associate with bees! What a delightful walk through your gardens! Still a bit cold here, but I saw my first bee in our gardens! He as a brave little soul. How well mannered your bees are, no cheating by poking holes in the neck of the flower, they go right in. I'm with you & the pollinators, bring on the bright colored flowers! Lovely bees Gail - I was watching "my" bees today as they bury their heads into the centre of the aquilegias that have spread themselves around the garden. Gorgeous pics and such busy bees. They must be ecstatic to have found your amazing flower gardens. Glad to see you tolerate the pink primrose. It quite be a nuisance out here, as well, but I'm very fond of those pretty pink blooms. I get excited when I see pollinators in the garden! Your pictures are delightful! Are these the bees that bore into wood? They are all over my mother's house along the wood right under the roof line. I don't know what to do but I'm afraid they may be causing damage to her house. I'd like to repel them without killing them if possible. Great photos as usual! I love that yellow baptisia! 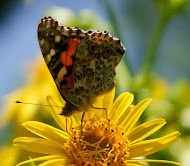 Your garden is a beautiful haven for pollinators! Gorgeous pictures Gail! So clear. Great shot of the Carpenter Bee in flight. You have such diversity both in flora and fauna in your beautiful garden. Nice! Although I can do without the carpenter bees. They are scaring the kids away from the swingset. I like that daisy and I think we may have a bit of that penstemon in our garden - or one very similar. Delightful posies and pollinators! The feral bees (from a hive in a neighbor's tree) are back in my garden this year, so I'm thrilled. I too salute the bees and grow plants that they love. You have beautiful images of them and the plants that attract them. I only wish I could tell one kind from another. Okay, the bee photos are wonderful but the one shot of your GORGEOUS front garden is what has me captivated! Wow. It looks so beautiful there in springtime Gail. I loved the exuberant wide-view photo with . . . what's that striking blue flower spike in the back . . . oh wait, it's the bottle tree! Looking good. Love those little pollinators, maybe not so much as the Carpenter Bee. He's eating my grill table up. OH MY. Hope the grill doesn't fall while I'm grilling. Fabulous photographs Gail, and lovely to have the wider shot that adds context. I was thinking of you yesterday when I was planting out my goodies from the Malvern Spring Show and found them - and lots of other plants - noisily buzzing with several types of bee. You continue to be a great source of inspiration. Thank you! Love your bee bottom shots, dear Gail. A 'bee-u-tiful' post! Gail, I think the Penstemon X (at least, I think that's what it is. . . ) that you sent me three springs ago may be blooming size this year. I'm looking forward to enjoying the blooms and the pollinators they attract. Your yellow baptisia is gorgeous, as are all the fantastic bee photos. Wow Gail! So many cool blooms & bees - you are lucky to have so many colorful natives!